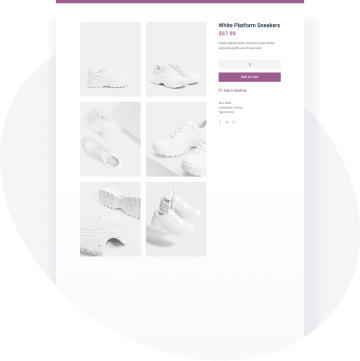 Add versatile image galleries to WooCommerce product page templates built with Elementor. Choose from different Gallery layouts to showcase the product images in the most attractive ways. Use any of the 4 gallery widgets for adding product images to the Single product pages built with Elementor. 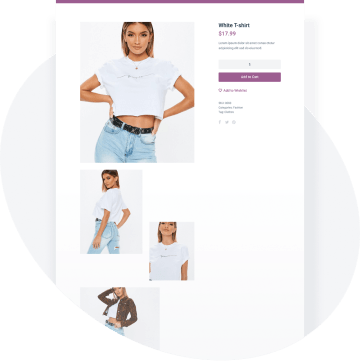 Display product images in the form of a slider with a vertical or horizontal pagination and lots of stylization settings. Create an appealing gallery showcasing a large featured product image at the top and showing off other images below it. 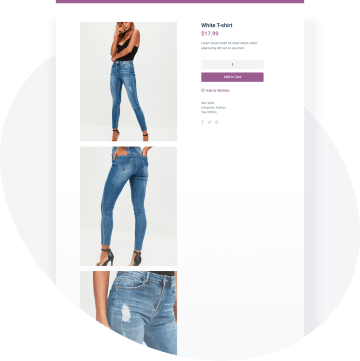 Add a brand new product gallery in the form of an appealing grid, showcasing the product images, or even a video overview.